A pointless journey to Evesham! After the splendid win over St. Albans City last Monday, it was hard to take this heavy defeat, although Gloucester City have been doing well recently and have climbed away from the lower reaches of the table. After a goalless first half, our defence, which has performed well despite an injury crisis, made too many mistakes in the second half and gifted the home side the chance to take control of the game. The forecasted heavy snow did not materialise until the evening, but there was a bitterly cold wind which chilled everyone, whilst the heavy pitch did little to help our passing game and both sides struggled to produce good football. However, we had the better of the opening play and were the better side for the first 25 minutes of the game. Nicholas Bignall twice went close with early chances, both just of target, and a number of corners threatened the Gloucester goal. There were few other chances in a rather dour first half although Gloucester finished on the ascendancy and forced a number of corners themselves. 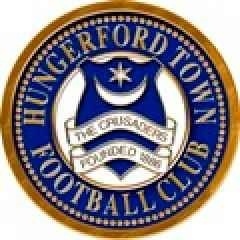 But the Hungerford defence was found wanting after the interval and the home side took the lead only two minutes after the restart when Jed Williams was left unmarked in front of goal and easily beat Marcus Beauchampto suddenly change the game. Joe Parker fired home as another defensive slip (literally) gave City their second goal after 63 minutes and, although Bignall hit the side netting soon after, we could not get back in the game. Louise Soares then limped off having been cut down by a Gloucester defender, a foul that strangely went unpunished by a refereeing performance that could be best described as inconsistent. Substitutes Alex Wall and new loan signing from Bristol Rovers Lewis Leigh-Gilchrist both came on but another defensive mistake let in the home side for their third goal as we tried to pass the ball out of defence, when the heavy pitch demanded a “big boot”, and substitute Harry Williams gave Beauchamp no chance. The same player scored again near the end on the break as we desperately tried to force a goal and the rout was complete in a match which was certainly “a game of two halves”.